"My Dad was the most prominent CPA in Iowa City back in the 1960s - 1980s before he retired to teach accounting at the University. In addition to being very good at what he did, he invested a lot of time building a network of relationships with people in the community. He was active in the Chamber of Commerce, in Rotary, was the president of the local Home Builders Association (while not a builder), and on the board of the local Catholic school (while not Catholic). There were other CPAs in Iowa City at the time, but none were as successful as Dad, and none worked as hard at building connections with his/her target audience. It is still important to small businesses and non-profits to build meaningful networks of people who share common interests, and to expand your network of connections to those who don't yet know that they share a common interest with you. Much can be done with direct face-to-face meetings, and you should do as much networking as you can make time for. Join your local Chamber of Commerce, service club, networking group, and volunteer for whatever worthy endevour gives you satisfaction. You never know when the relationship you build will become your next client or benefactor. Just remember that you have to invest time in building relationships, you can't just join to get your name on the roster and expect people to contact you. The same is true with Social Media. Just as it is a fine-able offense in my Kiwanis club to directly promote your business, I build friendships while performing service, and indirectly promoting our business to members of our community. The advantage of social media, is that you can build relationships globally, and in ways that are impractical to do in a face-to-face relationship. But the same rules apply, you don't build a relationship by hard-selling any person who wanders across your Facebook page. You build a relationship, some of which become mutually beneficial beyond their original context, and do it in just 15 minutes per day*. 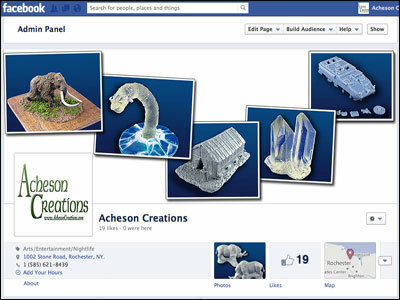 Craig recently launched his Facebook page and is growing it with regular announcements and photos about new products and upcoming shows. 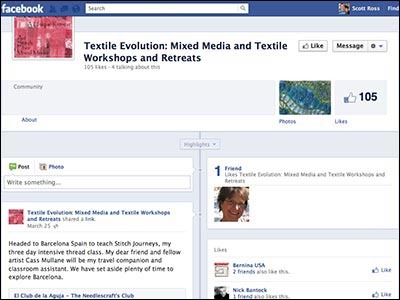 Liz has over 500 Friends and 100 Likes on Facebook due to her ongoing correspondence with the community of textile artists.